Japan's most famous mountain now has 4G coverage. An LTE network on Mount Fuji went live Thursday, providing download speeds of up to 75Mbps on its peak, mountain trails, and rest huts. NTT DoCoMo, Japan's largest mobile operator, will provide access to its subscribers as part of its "Xi" service. DoCoMo said it will provide the service from Thursday through the end of August, to correspond with the mountain's busy climbing season. Tourists are expected to turn out in record numbers this year because Mount Fuji has been named a World Heritage site by Unesco. It has long been a Japanese tradition to climb the mountain late at night and arrive at the top in time for sunrise, and in recent years climbers have added the practice of beaming photos to their friends and family directly from the peak. Mount Fuji has had a mobile network since 1999, and received an upgrade to 3G in 2005. DoCoMo operates six cell towers at various locations on the mountain, plus two boosters near the peak to provide coverage. Mount Fuji is wired for electricity, which also powers the restaurants and mountain huts, but it only runs during the official climbing season. Japanese carriers including DoCoMo compete to provide temporary coverage to crowded areas, especially during peak travel seasons such as the summer holidays. Mobile base station trucks are a common site at concerts, beaches and the country's popular fireworks displays. DoCoMo said in January it is building a fleet of 30 truck-based LTE stations that can create networks from scratch or add capacity to existing networks. The operator said the trucks will be used for temporary events and to support regions hit by earthquakes and other natural disasters, and some will be outfitted to support speeds of 112.5Mbps. DoCoMo also operates 50 trucks that support its older 3G network. 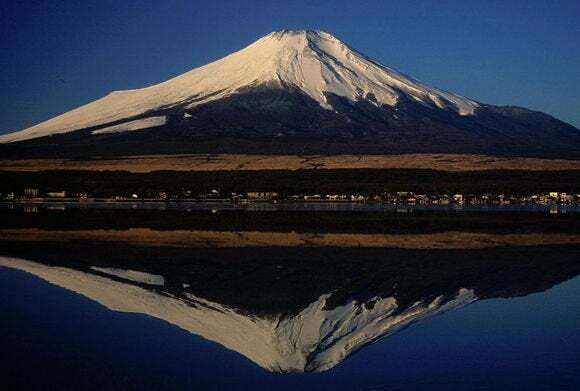 Mount Fuji straddles the Japanese prefectures of Shizuoka and Yamanashi, with several routes to the top. At 3,776 meters the volcano is Japan's highest mountain and can be seen from Tokyo on clear days.